Prévoir un épidémie - France 2. Jan 31, 2015. Epidemie, la nouvelle menace - Encyclo. Feb 11, 2014. Comprendre la propagation des epidemies - Corpus. Oct 2014. Tout peut changer - France 3. Dec 9, 2013. Epidemies, la menace invisible - Arte. Sept 9, 2014. CTV Canada AM - Jan 30, 2007. Pacific Standard - "Fighting Epidemics With Math" May 7, 2015. APS Physics highlight- "When does a disease turn Epidemic?" Apr 8, 2015. La Stampa (italian) - "Frontiere chiuse contro Ebola" Il Big Data svela che e' un errore. Nov 19, 2014. Corriere Comunicazioni (italian) - L'Ebola? Si sconfigge (anche) con i big data. Nov 14, 2014. Inserm - Ebola: les restrictions de transport n'empechent pas la diffusion du virus. Nov 7, 2014. Bloomberg Businessweek - Ebola travel bans buy only time, not safety. Nov 4, 2014. The Economist - Dr. Seldon, I presume. Data from social networks are making social science more scientific. Feb 23, 2013. The National (the UAE national newspaper) - Battling human diseases - on a computer. Apr 26, 2011. The Lancet - Preparation for a pandemic: influenza A H1N1 . TGR Leonardo. Dec 4, 2007. Science Daily. SARS: a model disease. Nov 21, 2007. Scientific Computing World. Academics tackle epidemics. Aug/Sept 2007. Social Atom Blog. Predicting epidemics. Mark Buchanan. July 2, 2007. Sound Medicine, WFYI. Predicting global flu outbreak. April 8, 2007. Le Scienze. 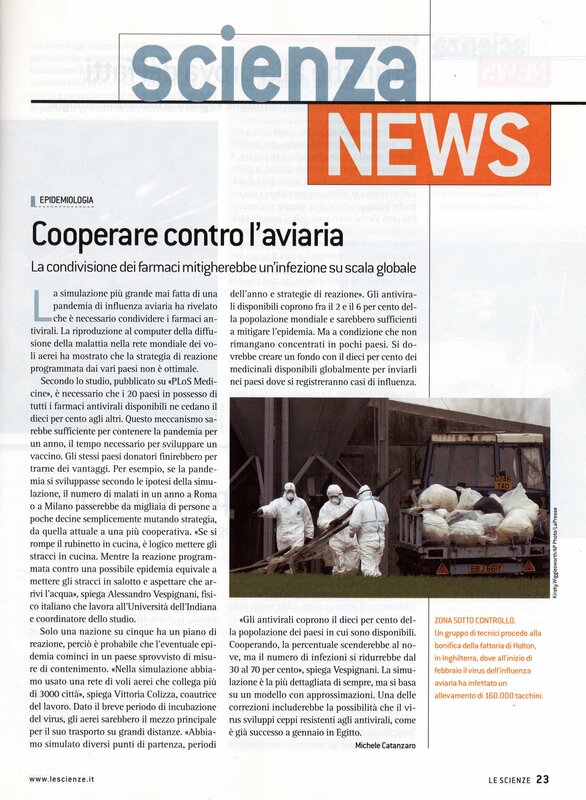 Cooperare contro l'aviaria. March 2007. FOX 59 News at 10. Feb 19, 2007. Science Daily. Bird Flu: Predictions Prompt Call for Antiviral Drugs to Be Shared. Jan 23, 2007. CORDIS News. European scientists develop model on potential flu pandemic. Jan 23, 2007. Le Monde. Un scenario catastrophe, a moins que... Jan 27, 2007. New Scientist. Will the drugs still work?. Jan 27, 2007. Science Coalition. IU scientists use NSF funding to assess risk of potential flu pandemic spread via global airlines. Jan 2007. Homeland Council. Scientists assess risk of potential flu pandemic spread via global airlines. Jan 25, 2007. Indianapolis Star. IU team has pulse on pandemic preparation. Jan 23, 2007. CNRS Press Release. Grippe aviarie: des modeles mathematiques pour etablir les differents scenarios d'une pandemie. Jan 23, 2007. IU Press Release. IU scientists assess risk of potential flu pandemic spread via global airlines. Jan 23, 2007. CNRS Magazine. The sky is no limit. May 2006. France ST. Le role du transport aerien dans les epidemies. April 24, 2006. Indiana Daily Student.New model to predict spread of disease through air travel. March 07, 2006. Journal du CNRS.Epidemies: le role des avions. March 2006. Indiana University Home Pages. Predicting pandemics. February 24, 2006. L'Express. Virus: voyage en avion. February 16, 2006. Le Figaro.Le transport aerien, principal vecteur des epidemies humaines. February 08, 2006. Agence Universitaire de la Francophonie. Prevision des epidemies: le role du transport aerien. February 6, 2006. L'Actualite du CEA.Prevision des epidemies: le role du transport aerien. February 6, 2006. CNRS Press Release.Prevision des epidemies: le role du transport aerien. February 06, 2006. Indiana University Press Release. Model forecasts global patterns of airline-carried diseases. January 31, 2006. La Recherche Special Issue. January, 2006. TF5 (France) - Jan 26, 2012. LCI Sante (France) - Jan 27, 2012. Infection forecasts powered by big data. Nature Outlook, March 7, 2018. When Google got flu wrong. Nature News, Feb 13, 2013. ANR Actualités, feb 17, 2015. Top Santé, Jan 30, 2012. E-santé, Jan 26, 2012.Femme Actuelle, Jan 30, 2012. Le Figaro, Jan 25, 2012. Le Figaro Sante, Feb 6, 2012. TG Leonardo (Italy) - Feb 25, 2011. Eccellenze al Femminile, Torino - Jan 17, 2009. TG2 (Italy) - Jan 20, 2008. Irish Times - Where the odds are stacked in favour of contagion. May 5, 2009. Digicult blog - INFECTIOUS: STAY AWAY. May, 2009. Inserm. Dissemination des maladies infectieuses, un nouvel modele predictif. Sept 24, 2013. Allodocteurs. Un nouveau modele pour evaluer les risques de pandemie. Sept 24, 2013. French Ministry of Agriculture, Food, Environment. Le CNRS et l'INSERM ont lance une recherche sur une modele predictif sur les epidemies animales. Sept 6, 2012. Science et Sante. Epidemies animales - a la pursuite des fermes sentinelles. INSERM Magazine, Sept/Oct 2012. Allodocteurs. Modeliser les epidemies animales pour mieux les surveiller. July 2, 2012. La Stampa - Grande Fratello in ospedale. Nov 17, 2009. RAI1 national Italian TV: TG1. Nov 11, 2009. Repubblica.it – Faccia a faccia con il contagio, un chip per prevenire la malattia. Nov 10, 2009. Il Messaggero.it – Un chip per prevenire l’infezione. Nov 10, 2009. L’Unità – Salute: Bambino Gesù; con chip studio diffusione infezioni. Nov 11, 2009. Science – Spreading the flu. May 22, 2009. Irish Times – Where the odds are stacked in favour of contagion. May 4, 2009. Irish Times – Slide show about the Infectious exhibition by Bryan O’Brien. May 2009. Financial Times. Forscher simulieren WLan-Wurmepidemie, Feb 4, 2009 (german). New Scientist. City WiFi networks vulnerable to virus attack, Jan 28, 2009. Scientific American Podcast. Wireless networks are soft virus targets, Jan 29, 2009. MIT Technology Review. Modeling malware over WiFi, Jan 28, 2009. Red Orbit.Researchers expose WiFi network weaknesses, Jan 28, 2009. BBC News. Alarm sounded over WiFi networks, Jan 27, 2009. Radio 3 Scienza. interview, Jan 27, 2009 (italian). La Vanguardia. Las redes wifi favorecen la difusion de virus informaticos, Jan 27, 2009 (spanish). Galileo. Virus, WiFi a rischio, Jan 27, 2009 (italian). Ars Technica. WiFi flu:viral router attack could hit whole cities. Jan 02, 2008. Dark Reading. Urban WiFi routers at risk. Jan 03, 2008. Herald Times. What's a rich-club? Concept originated in informatics and social networking study at IU. Nov 14, 2011. Nature Physics News & Views. Complex Networks: From Data to Models. M.C. Gonzales & A.-L. Barabasi. Nature Physics 3, 224 (2007). Nature Physics News & Views. Lies, Damned Lies and Statistics. Nature Physics 2, 73 (2006). Nature Research Highlights. Exclusive clubs exposed. Nature 439, no.7074 (2006).